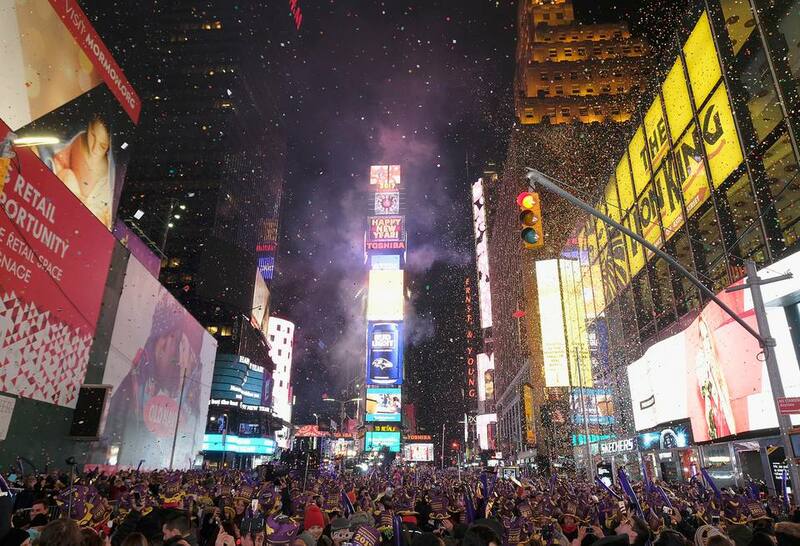 Yes, most New Yorkers scoff at the idea of spending New Year's Eve in Times Square, reciting the predictable list of gripes: it's too cold and too crowded; there aren't enough bathrooms; and, perhaps most worrisome: there isn't any liquor! Granted, these dissuading factors are pretty much constants, year after year. Still, while they talk about freezing their toes standing outside in frigid temps and feel downright deprived without a champagne flute in hand, they still think it's a bucket-list experience that everybody should try out at least once. If you're going to do it, do it right. Here's the ultimate survival guide for braving the crowds and the elements and making the most of a memorable New Year's Eve in Times Square. It's a free event that's first-come, first served, so the earlier you show up on December 31, the better. The die-hards willing to stand around for nearly a dozen hours till midnight will start pouring in as early as 1 p.m., with some of the best viewing spots already claimed by mid-afternoon. At around 6 p.m., the New Year's Eve ball will be raised and lit, and as crowds become thicker throughout the late afternoon and early evening, police will begin closing streets at 43rd Street, moving northward. The NYPD will have security checkpoints set up for entry to the event, so be prepared for lines. Early birds will get the best views of the ball and the entertainment stages. Though note that the earlier you show up, the longer you'll have to stake out your spot, sans interruption: as crowds assemble and police barricades go up, those who leave in search of food or bathrooms will not be permitted to return to their places. On the flip side, while latecomers can still revel in the general atmosphere, they're unlikely to have a decent view of the ball or stages. The famous New Year's Eve Ball descends from a 77-foot flagpole set atop One Times Square (at 43rd Street and Broadway). Viewing spots for the ball are best found along Broadway, from 43rd Street to 50th Street, and also along Seventh Avenue, from 43rd Street to 59th Street. For entertainment, cluster around the performance stages assembled in Times Square. Streets begin closing via police barricades in the late afternoon/early evening, starting at 43rd Street and Broadway (and moving northward as revelers arrive). There are video screens set up on One Times Square, and there are additional screens set up throughout the event area; the main sound system is located at the intersection of Broadway and 7th Avenue. Note that access to the event is from 6th Avenue or 8th Avenue only (no one will be allowed to cross Broadway/7th Avenue once the streets have been closed). The Times Square Alliance’s website outlines access points. Quite honestly, there's a whole lot of standing around and waiting with not much of anything at all happening before 6 p.m., when the ball is raised and lifted, with its ascent accompanied by pyrotechnic effects. For those who show up early enough to get coveted spots up close enough to view, the buildup to the ball-drop is preceded with musical entertainment after 6 p.m., with the bigger acts going on closer to midnight. For those without a first-hand view in the center of the action, several large video screens will be set up throughout the event area to stream live coverage of goings-on. There are also limited party favor handouts (do bring your own, too) like balloons, hats, etc., which you'll be able to test-run on hourly practice countdowns (led by personalities like Anderson Cooper), as countries ring in the New Year around the world. The crowd really revs up for the countdown to midnight, to bid farewell to 2018, and usher in a memorable start to the new year. After a 60-second descent beginning at 11:59 pm EST, the ball will drop, the pyrotechnics will explode, music will play, and a (literal) ton of confetti will rain down on it all as the crowd goes wild and couples kiss the moment away. Spectators are sufficiently equipped with balloons, pompons, noisemakers, and more. The confetti is inscribed with new year wishes from people around the globe—you can submit your own wish to be included online, via the Times Square Alliance's "Online Wishing Wall." Times Square has been party central for New Year's Eve since 1904—an inaugural bash that also celebrated the opening of the new headquarters of The New York Times with more than 200,000 revelers. A tradition was born, and when fireworks were temporarily banned in the city, the tradition of the ball drop began for the 1908 celebrations; it's been continued ever since (with the exception of a couple of years during WWII). The famous illuminated ball, dropped from a flagpole atop One Times Square, is crafted from Waterford Crystal—it measures 12 feet in diameter, weighs a whopping 11,875 pounds, and can create a mind-boggling display of more than 16 million colors. Bundle up and dress in layers: This is one party where you can ditch glamour in favor of warmth and comfort! It can—and often does at this time of year—dip well below freezing. Unless you catch a lucky break with a warm spell, approach the outing as if you were hitting the slopes: heavy jacket, scarf, hat, mittens—the wind-and water-resistant works. Wear lots of layers that you can shed and add on as needed while you're standing around for hours. And don't forget about your toes! Wool socks and warm boots will help round it out, and by all means, make a comfortable choice: You'll be on your feet for hours, after all. Hand and toe warmers would also not be out of place. You can bring snacks and non-alcoholic drinks, though it's best if you come well hydrated with a full belly. While there are restaurants in the area, there are no food vendors embedded in with the crowds and you can't reclaim your place if you leave your spot in search of food. Aim to have good company in tow for passing the time with conversation, and pack some diversions (a book, phone games, etc.) to while away the hours if you're showing up very early. Leave the alcohol behind—it's illegal to drink in public in NYC, and the police will confiscate it. For security reasons, no large bags or backpacks are allowed. Leave valuables at home, too—crowds this thick are a pickpockets' paradise. Also, reconsider bringing small children: This is a tough event for little ones, with the lack of kid-friendly diversions and bathrooms. There are no portable or public bathrooms provided, and area establishments won't accommodate revelers who aren't customers, so keep your fluid intake to a minimum and go before you show. Public transportation is your best bet, with event-related road closures disrupting traffic flow in the vicinity (not to mention that hailing a cab on NYE is pretty much impossible). If you take the subway, avoid getting out at a stop in overly congested Times Square. Find out more at MTA's suggested directions, or visit the Times Square Alliance for suggested routes.